For centuries, we've had cheesecake. The earliest recipe in existence dates back to 230 CE from ancient Greece. Eventually, the Romans took over and in so doing, stole cheesecake, garnishing it with fresh fruit. 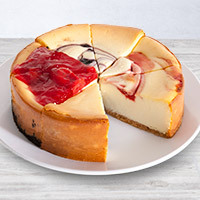 In more recent decades, fruit and cheesecake were discovered to be soul mates. When together, the perfect combination of sweet, creamy flavors are harmoniously united. 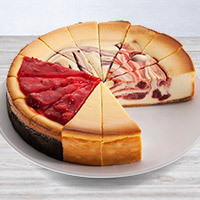 With our Fruit Cheesecake samplers, we achieve the perfect balance and variety of fruity flavors, making it something everyone can enjoy.